I have indeed been writing this blog now for a whole year. It was to be a little journal of my quilting, knitting, sewing, crafting, and gardening snippets that I used to write in my daily journal. More fun, as I could include all the myriad photos that I take too, and my family and friends could see what I had been up to. One year on and 8.000 + views from people all over the world. 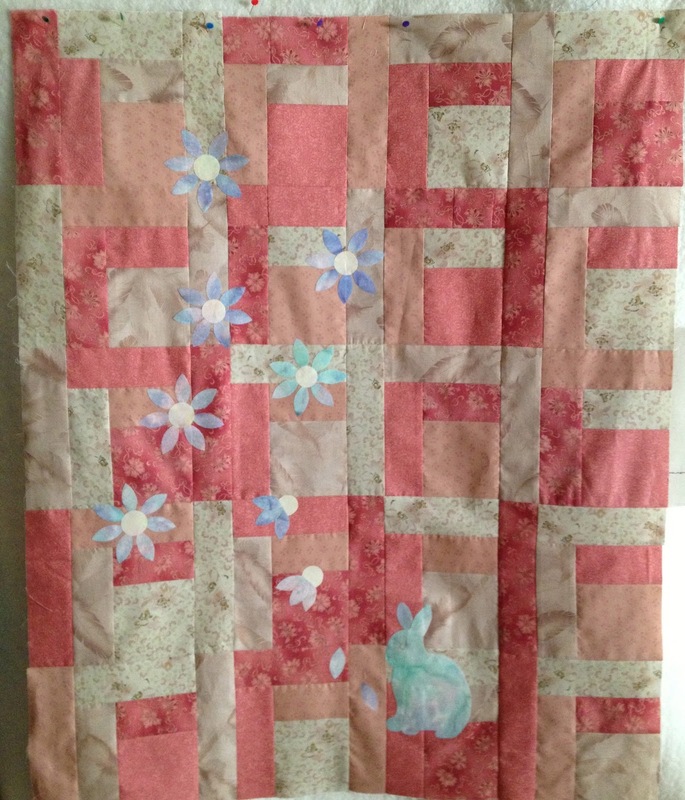 It has been some journey, and as a small thank you, I have made a little quilt to give away. 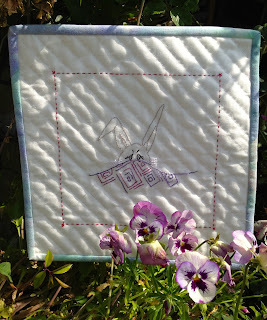 It is very tiny, roughly 10" X 10", and all you have to do is leave a comment on this blog to say why you would like to win it. A winner will be randomly picked on the 5th of August and I will post world wide. The winners name will be on the first blog after that. 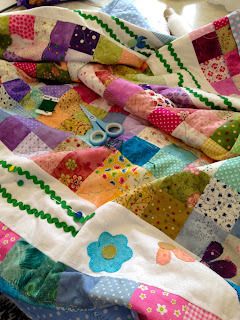 To make this quilt your self here is a tutorial. Cut yourself a 11" X 11" piece of background fabric and transfer the drawing of the rabbit and his quilt using a light box or tape it to a window. 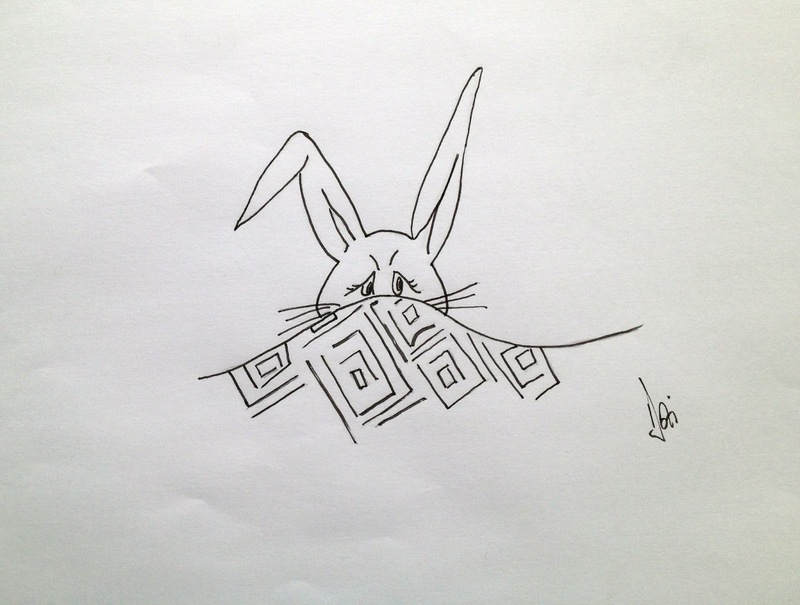 I use a fine Pigma pen but a sharp pencil is fine. 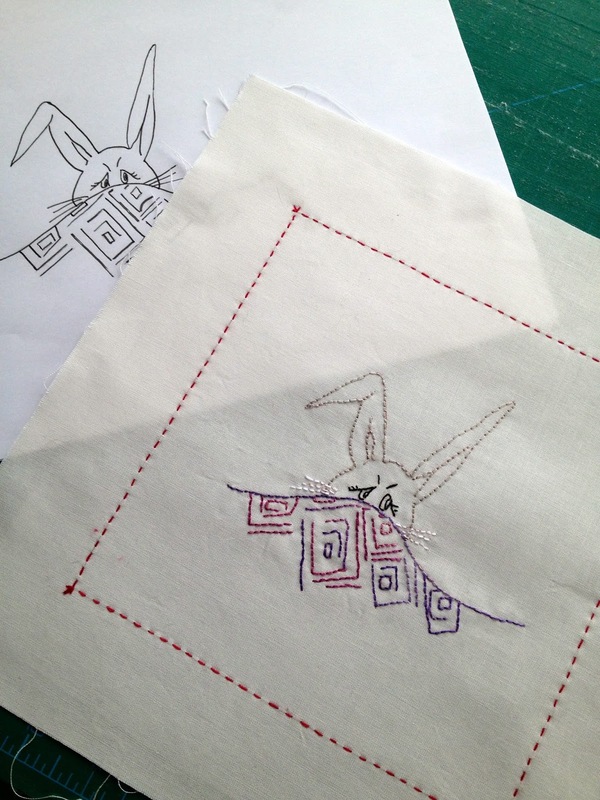 Having transferred your rabbit and his quilt to your fabric, embroider in your own colours. 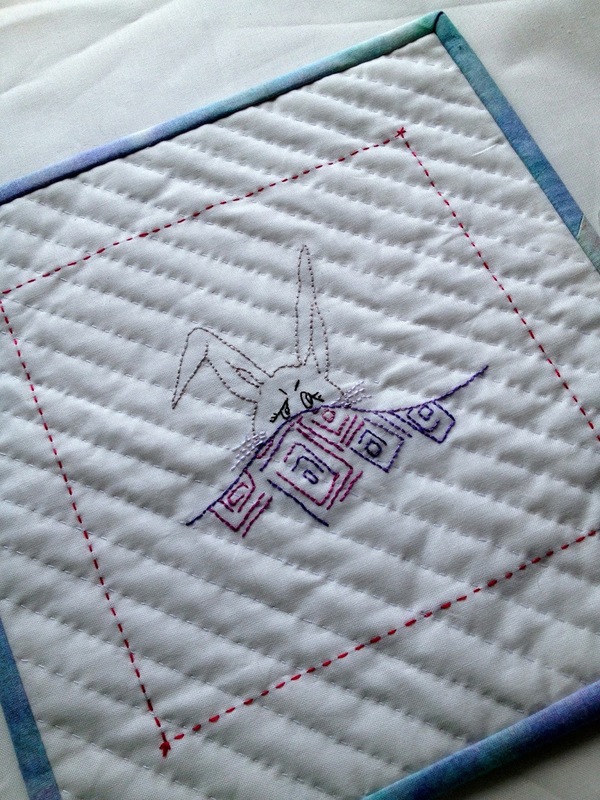 For his quilt I used a variegated thread and the bunny is a silver grey. 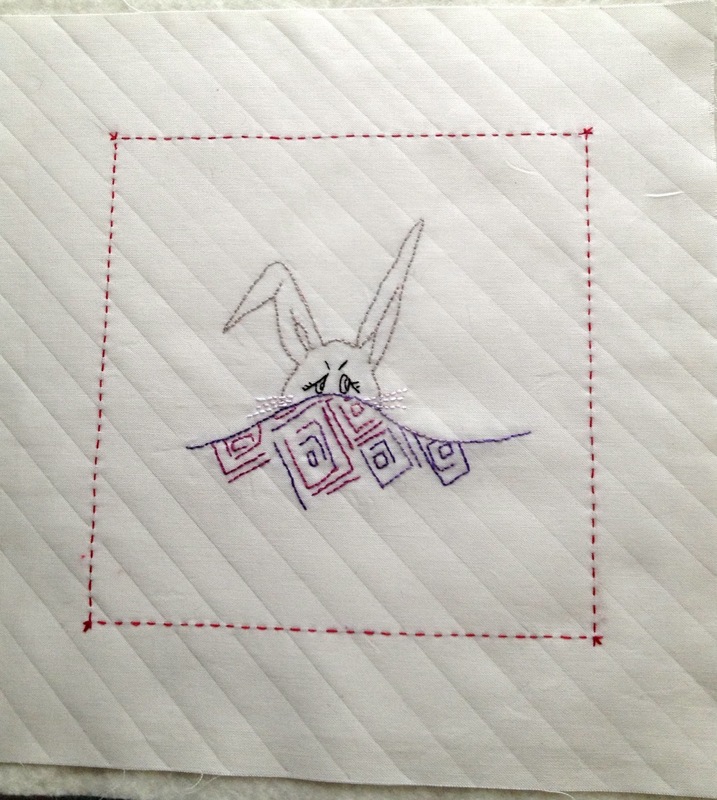 I also did a row of running stitches about 1 inch and a bit all around him so he was sort of framed. Next mark your quilting lines, mine are a half inch apart. 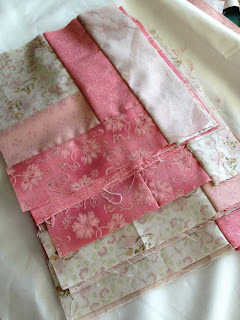 Sandwich your little quilt with wadding/batting, and quilt. 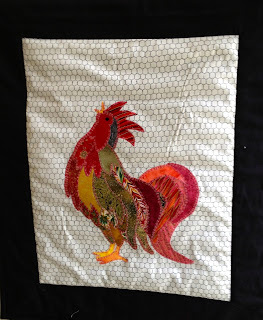 Mine was hand quilted but you could do it on a machine. 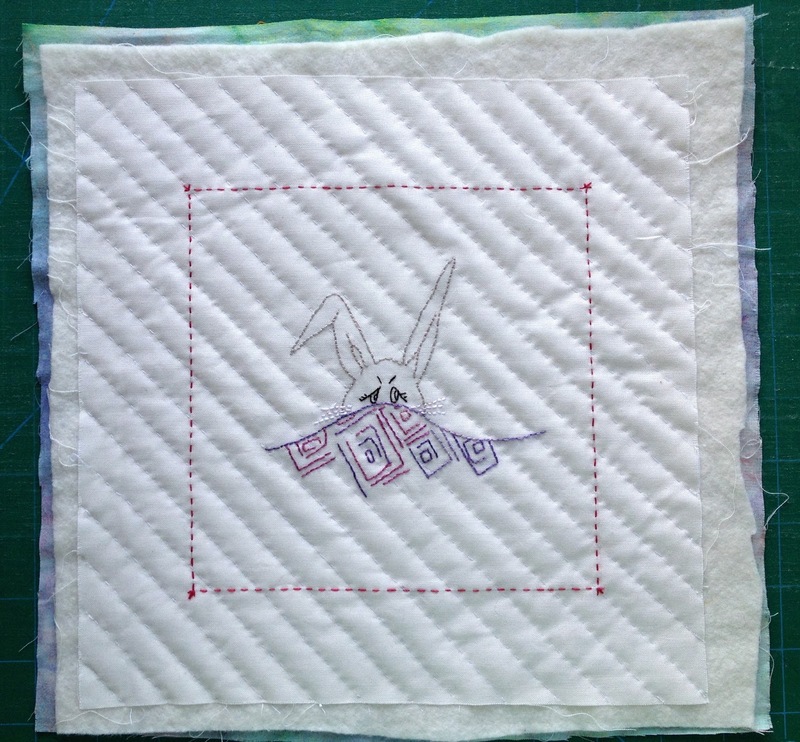 After quilting square up, mine shrank a little with the quilting. 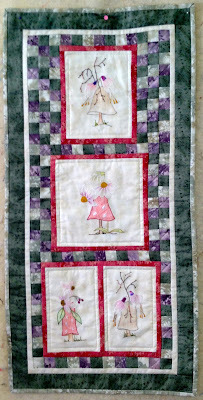 Back of quilt showing little hanging corners. Close up of hanging corners. 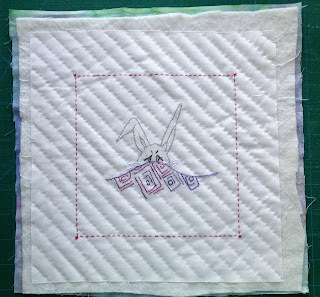 Hanging corners on this quilt were a 2 1/2" square folded in half and stitched on before you do your binding, piece of doweling cut to size and hung up. 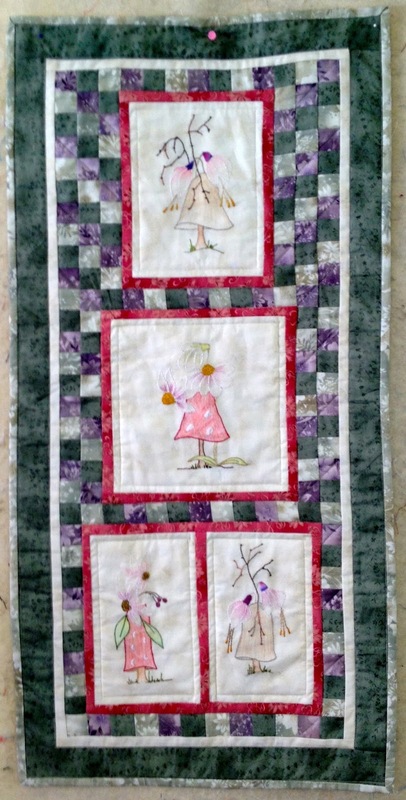 Now this little quilt could be yours, just comment on this blog and tell me why you would like to own it. It was a fun day at the Bee this week, lots of laughter, much stitching and of course too much cake eating. 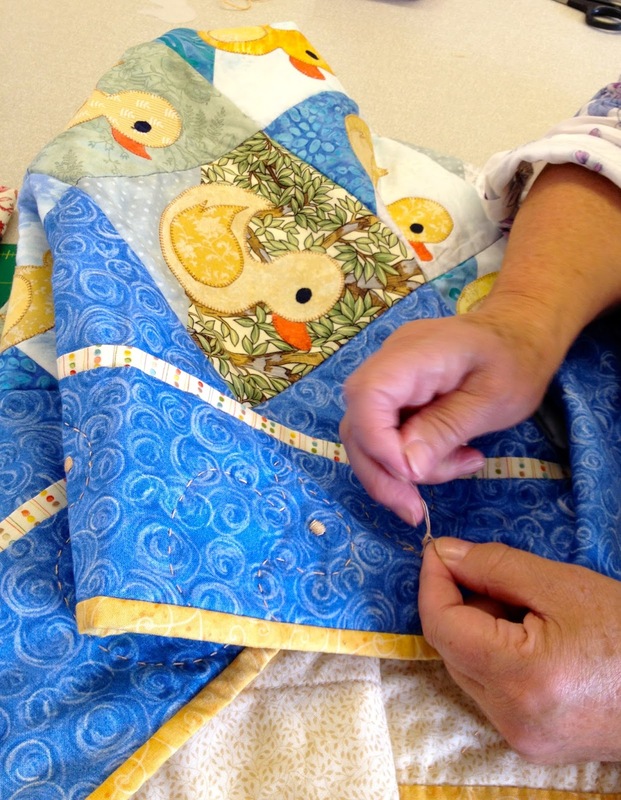 The Bee is a hand stitching group and that is what we were doing. Alison had started on block 4 of our mystery BOM, but I must show you a corner of her block 3. She had coloured her blossom and then embroidered it, it is so beautiful. 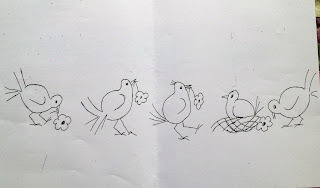 ( the instructions are on 2nd & 3rd of March on this blog). 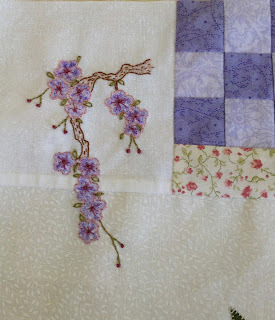 She has used a lovely selection of fabrics for this one as it's a present for her Mum's 92nd Birthday, I do hope she likes it. Isn't this heap just "scrummy", its what Ann was working on. She was rick racking stems for her appliqué flowers. I hope to get a picture of this finished quilt soon. May be we need less laughter and more sewing. This is a photo I took last week and forgot to include. It's Jean's Rooster and he is having a real crow, my he is colourful. 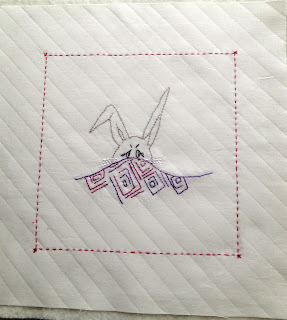 Me, I was working on a little tiny surprise stitchery quilt, which I hope to finish by the 31st of this month. On the 31st I will have been writing this blog for a year, and it's a little thank you to all my readers, a little free pattern. 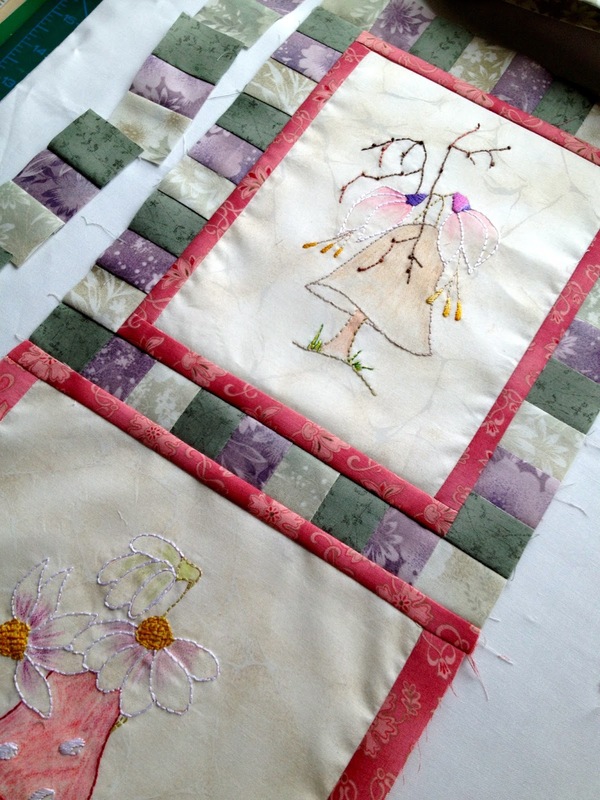 The little toadstool quilt is to feature in next years Fabrications Quilting for you, which is a really lovely quilting magazine here in the UK, so I have to get cracking and write up the instructions. It was Wednesday Club this week, which is, as you know held at Quilters Haven and I did finish sewing the binding on the Toadstool Quilt. So here is a little round up of what the "girls" were doing. Fiona just has the binding to put on her little hen quilt, This has a lovely country kitchen look. 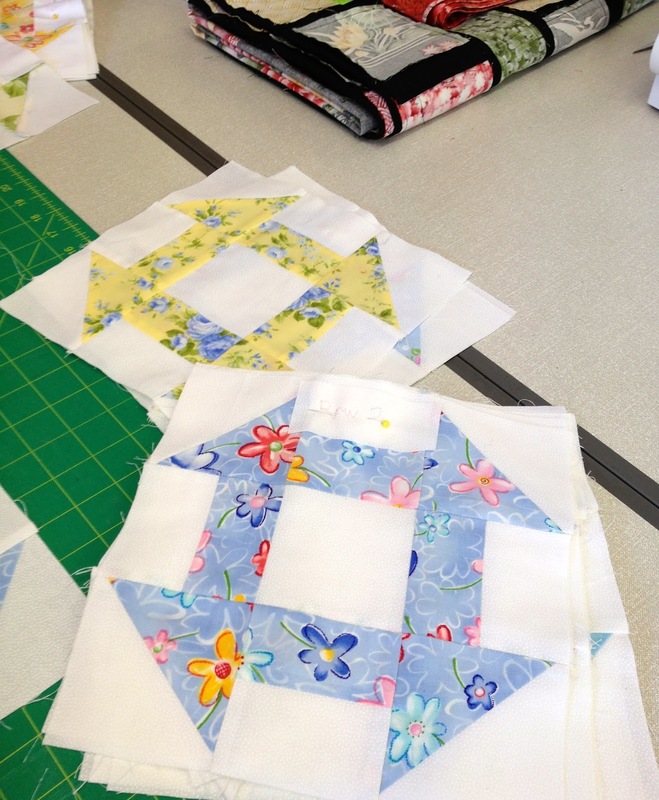 Ann was squaring up her mountain of Churn Dash blocks, this is going to be a lovely fresh quilt. 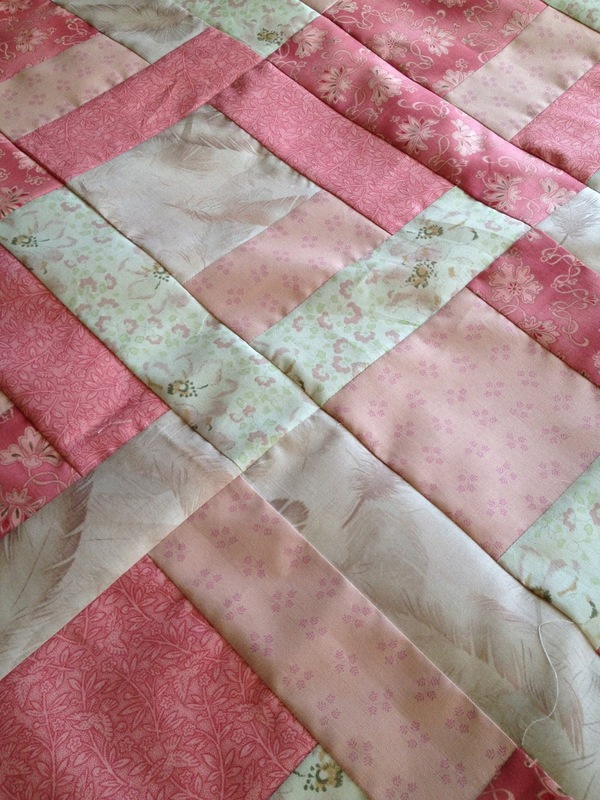 The churn dash block is one of my favourites. Jenny was quilting the second of her baby quilts, she is Soo into ducks. 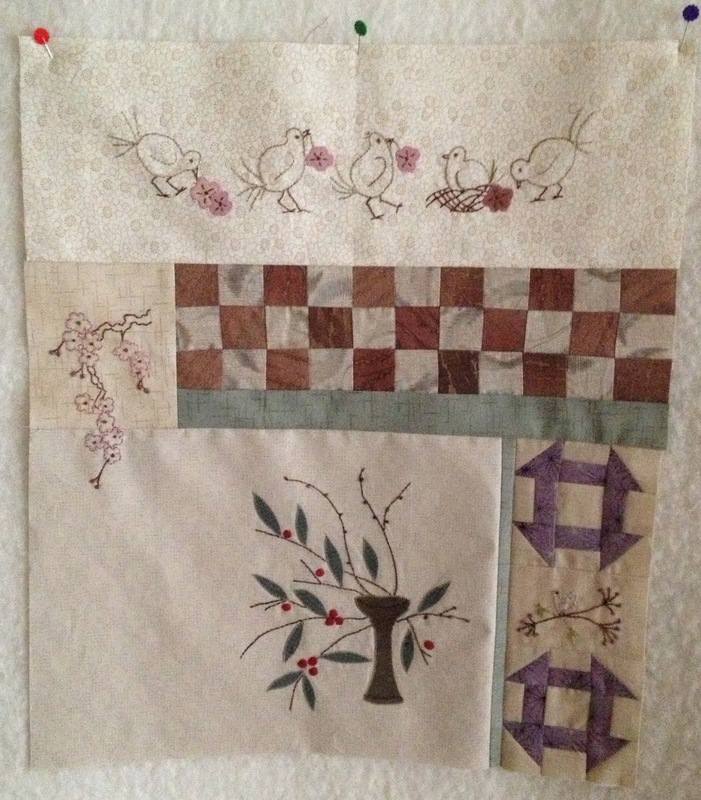 And last but definitely not least, this is Pippa's stain glass window quilt top. It was so large it was difficult to photograph. She is painstakingly perfect and puts us all to shame. Lots of the others were doing lovely things, but these are all the photos I took. 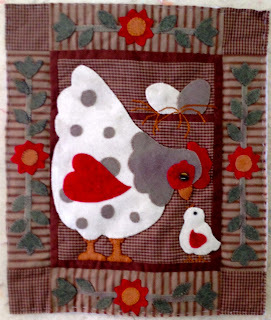 Well, here is block four and I do hope you are enjoying sewing along with me on this mystery wall hanging. It is indeed a mystery to me as well, as I am only two months ahead of you, and I am not sure where it is going at the moment. Blocks 1 2 3 & 4. 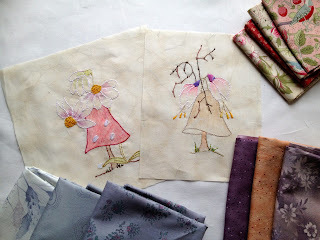 Embroider the birds and appliqué the flowers, in colours of your choice. Cut to size 15 1/2” x 5 1/4” and stitch to the top of blocks 1. 2. & 3. 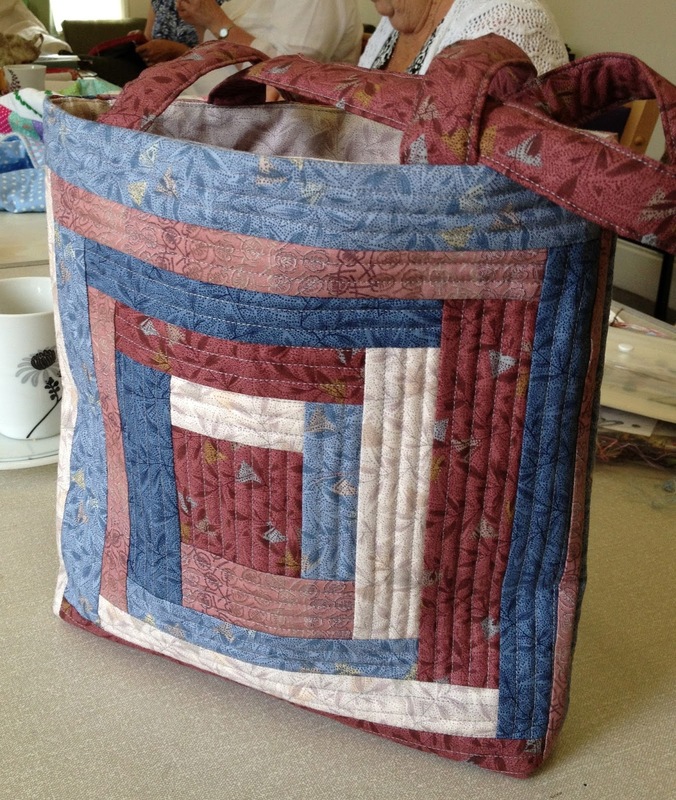 Several of the girls at the Bee this week were sewing this BOM, but the best thing was Alison finished her Wedding Quilt. It is very difficult to photograph as it is cream and white, but is so gorgeous. 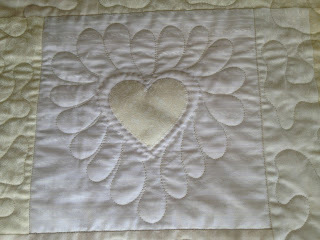 and this is a close up of the quilting. I have only gone off at a tiny tangent this week, as my gift box was getting low and a lovely lady had knitted me 64 little hats for age concern. Our total is 221 now, time to send them off. I found this little Owl tutorial on efemera-ink.blogspot.co.uk if you want to go off on a tangent too... or rather twit tawoo..
Whoooo indeed, it was a good weekend. 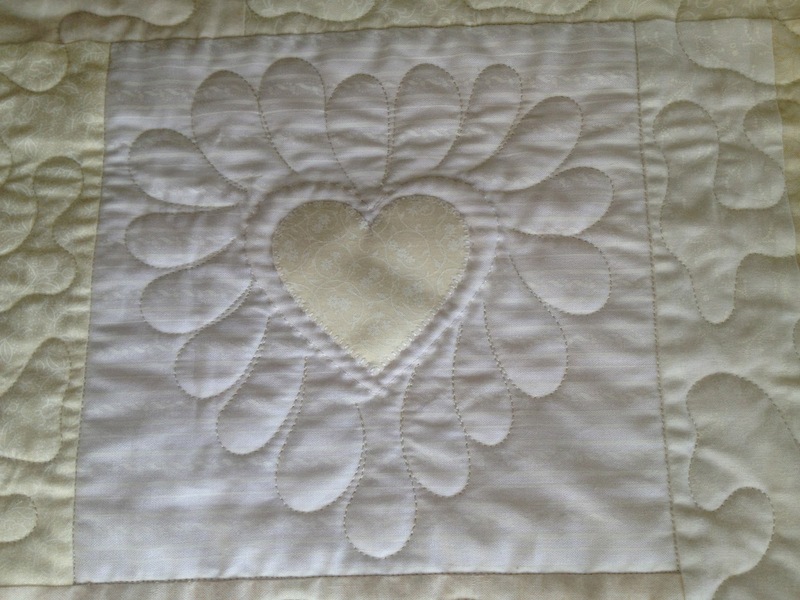 Andy Murray won at Wimbledon, which for me meant lots and lots of hand stitching. I can't sit in front of the T.V. without hand sewing. Which in turn meant I finished the linen quilt, as I sat there most of the weekend sewing and watching Tennis. 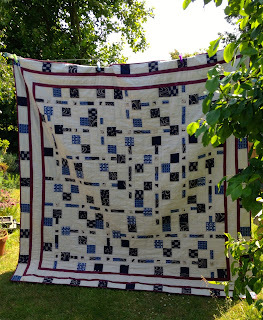 I have one happy husband, as I started this quilt some two years ago, and it was definitely down the bottom of the pile till he spied it. 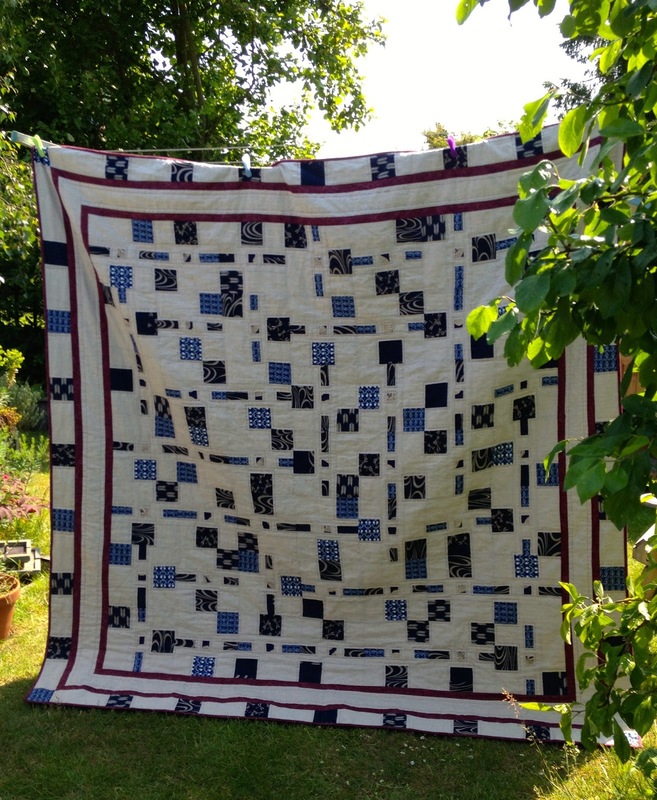 The name of the quilt is Japanese Squares, and was designed by Helen Richards. for PatternSpot.which is a lovely site if you are looking for inspiration. So today it's back to the mushrooms and it's all been changed again, back looking down the stash and I have now come up with more little bundles of fabric. 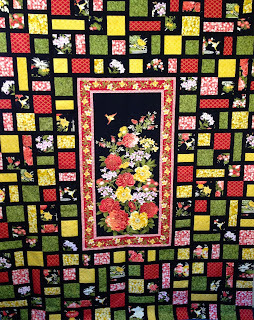 This bundle is a keeper, so I have been playing with little 1 1/2 inch squares, not sure why I did not cut all the blocks to crayon and embroider all the same size at the start. So I have made life a bit difficult to piece them all in. I do like a challenge.Ha! 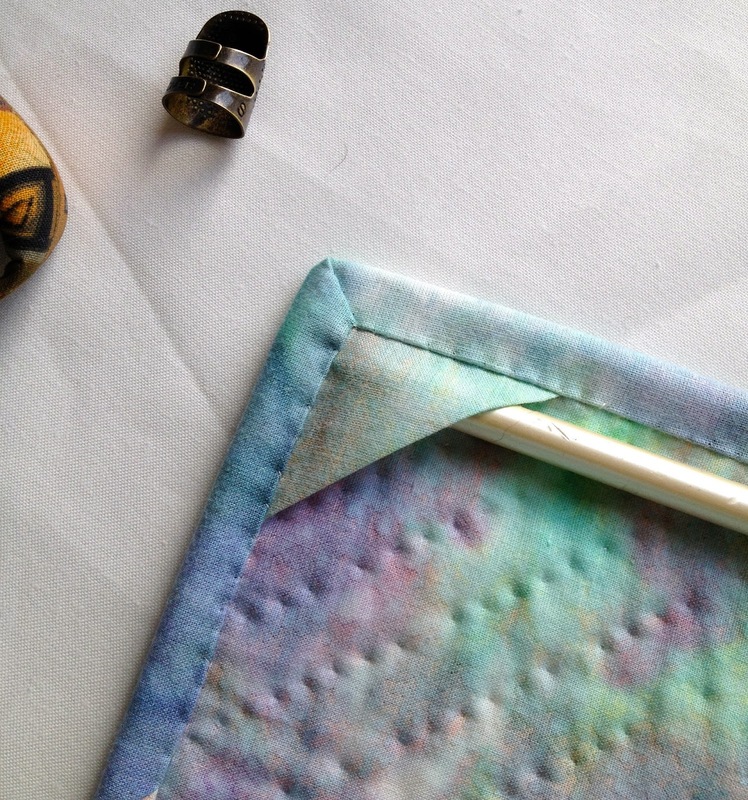 "Crayola" crayons are the best crayons to use if you are colouring your embroidery before you stitch. 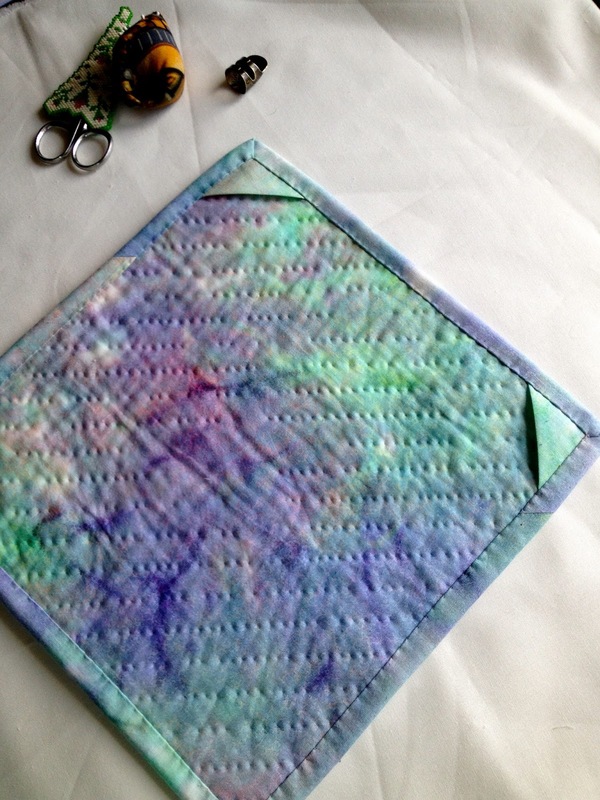 Colour the area with the WHITE crayon first, then the coloured ones and don't forget to seal your work with a hot iron and paper towels to set the colour. Yesterday I made 10 gooseberry crumbles to freeze, and today my husband has been picking our strawberries, he has also hulled them so guess what we are having for desert today, well it is a fast day and they are only 28 calories for 100 grams. Got to check out the block for this month, I hope to put it up around the 12th. 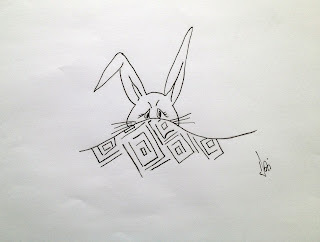 Yes, indeed " one of those weeks". You know the ones where every thing you do turns to you know what. As everyone knows Google reader expired on the 1st of July, and I have been repeatedly trying to to put the Bloglovin' button on my blog, to no avail. 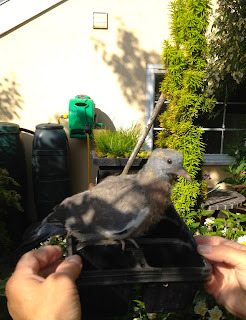 Two pigeons nested in our rose arbour, where we sit for morning coffee when the weather is good and they duly reared one scruffy looking chick, who on his/her maiden flight decided to fly into my green house. My husband carried him/her back to their nest, and then in the evening our Border Terrier presented us with one dead squab. 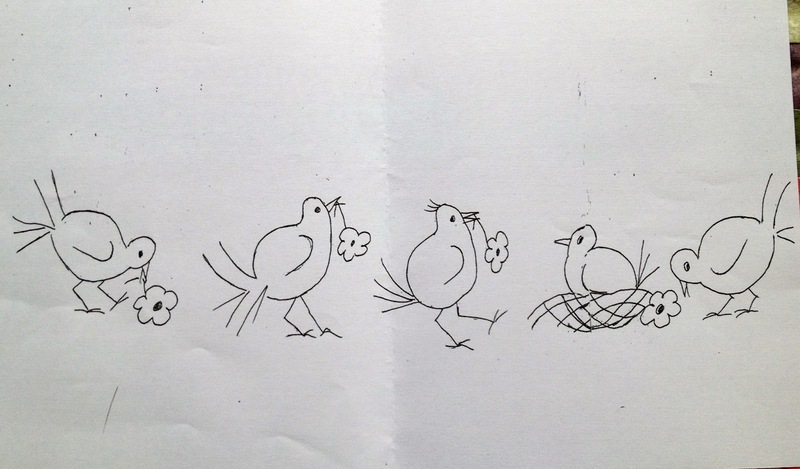 It was a very sad day..
Baby Pigeon being carried back to nest. 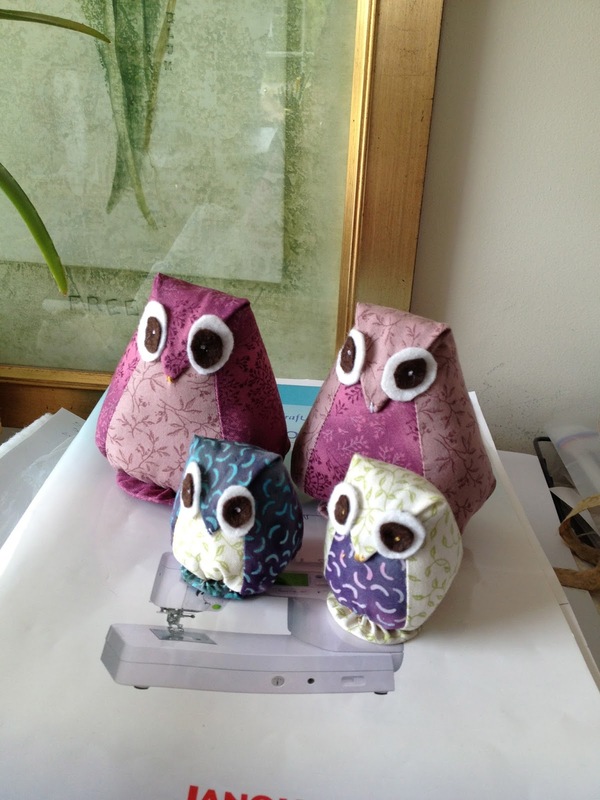 I made a trip to Bungay, to visit one of my most favourite quilt shops Sew and So's and have lunch with my friend Ann. We bought lots of fabric, and though I did not take my little mushroom blocks , thought I had bought just the right fabric to go with them. Not so, they just do not work at all. The fabric bottom left was the fabric I bought at Sew and So's. I then bought some more fabric at Quilters Haven as we were there for Wednesday Club bottom right, not sure they are right either. So then went through stash, top right, and think that might do better. There is a moral here some where, take your blocks with you when you go quilt shopping, or look through your stash first. 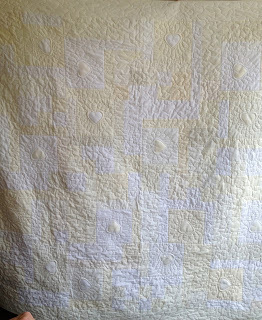 On the brighter side, I am about to make the binding for the linen quilt, as the quilting is nearly finished. This is mainly due to Wimbledon and the tennis. 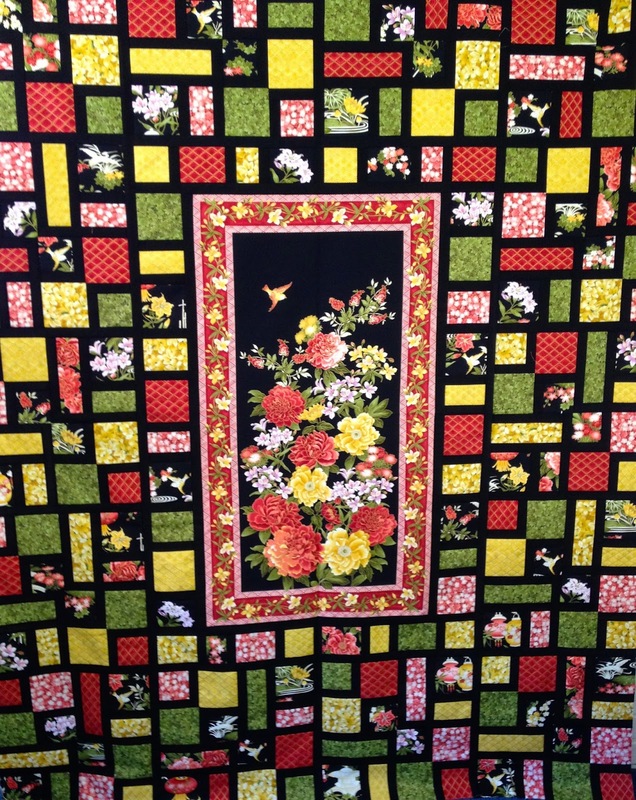 I do not feel guilty if I quilt at the same time as watching the tennis in the middle of the day.Ha! At Wednesday Club yesterday, Liz was making some summer tops for her little granddaughter. Oh how I wish I had some little ones to make some for.. 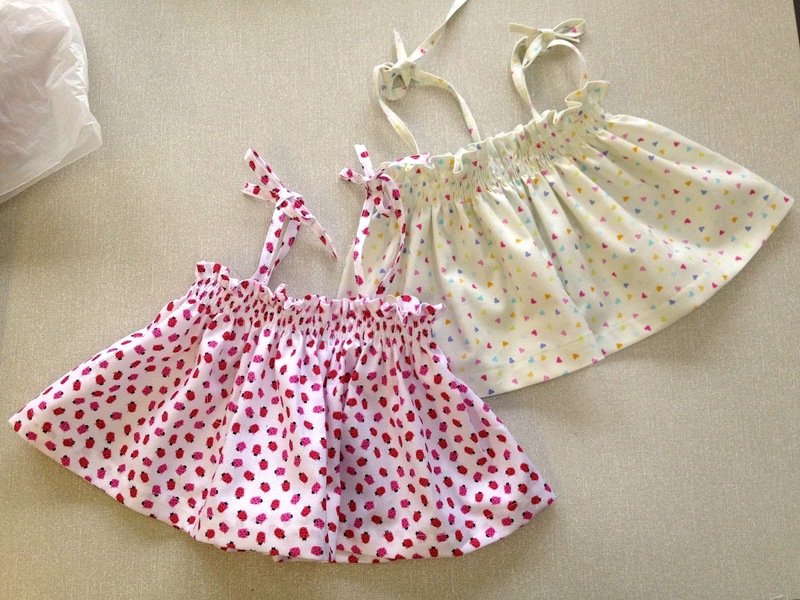 I hope we see photos of her granddaughter wearing these, they are just delightful . My car, that is very poorly and in the very expensive car hospital, will hopefully be coming home on Friday. Then we can give back the courtesy car my husband laughingly calls the corset, it's so tiny.....and life might get back to normal, well hopefully.